DALLAS – March 14, 2014 – At the intersection of atoms, Solo Exhibition by Kenn Kotara at Mary Tomas Gallery, 1110 Dragon Street, Dallas, TX. Opening reception April 5, 2014, 6 pm – 9 pm with the artist in attendance. Showcasing the latest works of Louisiana native and nationally-known artist Kenn Kotara this solo exhibition, At the intersection of atoms, includes an astonishing 49 artworks of Braille, works on paper, canvases, and suspended screen structures, The exhibition, which runs through May 11, 2014 is also featured at the DADA Spring Walk on April 19, 2014, Noon – 8 pm. Kenn Kotara, an Asheville, North Carolina based artist and a Louisiana native, holds a BFA in Graphic Design and an MFA in Studio Art. His architectural background and Louisiana roots permeate his abstract paintings and works in mixed media which are structured based on a grid system with layers of circular and linear shapes and color. His curiosity with space and form led Kotara to examine the Braille system of communication, perceiving the language of dots as geometry in miniature and bearing a natural relationship with the grid. Kotara’s work has been included in over 100 exhibitions internationally and is in numerous private, public and corporate collections. Mary Tomas Gallery has generously pledged a percentage of opening night sales to benefit the Reading & Radio Resource center in Dallas. The mission of Reading & Radio Resource is to create specialized audio content for children and adults with unique reading and learning needs. The programs they offer enhance education, advance careers, and strengthen community involvement for people who experience barriers to reading. Photo attached: “El Rio/The River” Hand-punched Braille dots of transcribed poem by Nobel prize winner Octavio Paz in Spanish and English. 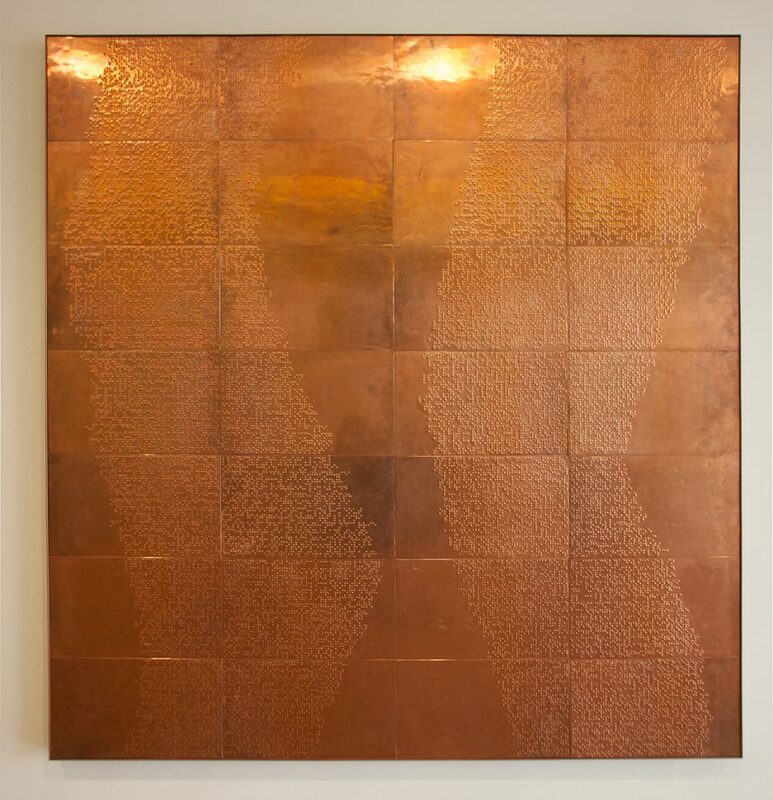 Braille copper on wood panel, 6’ x 6’ x 3”.